Pipes are available in 6 and 12 meter straight lengths, other lengths can be supplied to order. Pipes up to 110 mm OD is also available in coils of 50m and 100m, and can be supplied in longer lengths on drums. Black with blue stripe – For potable water. Black – For sewer and industrial applications. HDPE (PE100) has a MRS of 10 MPa. The hydrostatic Design stress for the material is determined by applying a safety factor of 1.25. The design life for the water industry requires a minimum life of 50 years, therefore the design stress for PE 100 is ( 8 MPa ). 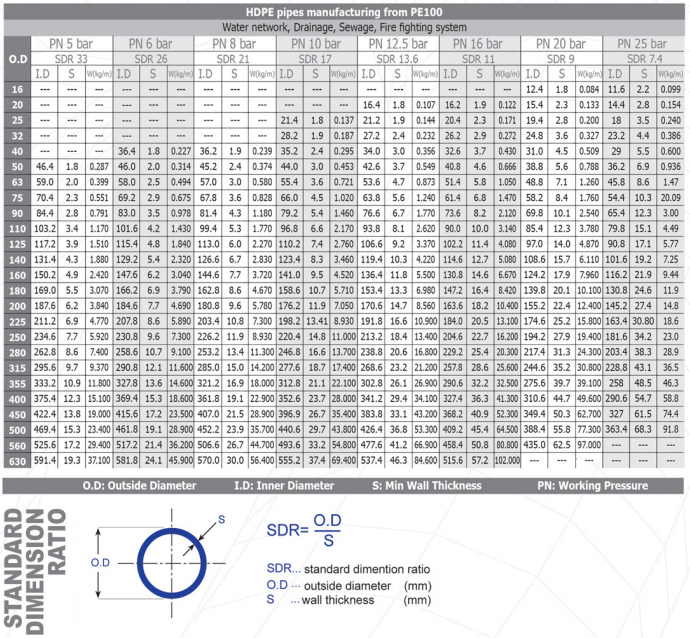 Polyethylene pipe pressure ratings are generally referred to in bar; 1 bar is approximately equivalent to 10.2 meter head.